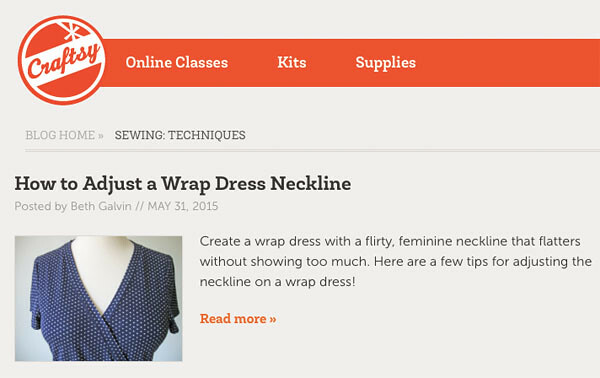 It's been a while since I posted links to my recent Craftsy sewing blog posts. I have done a few recently on fit adjustments so here they are. 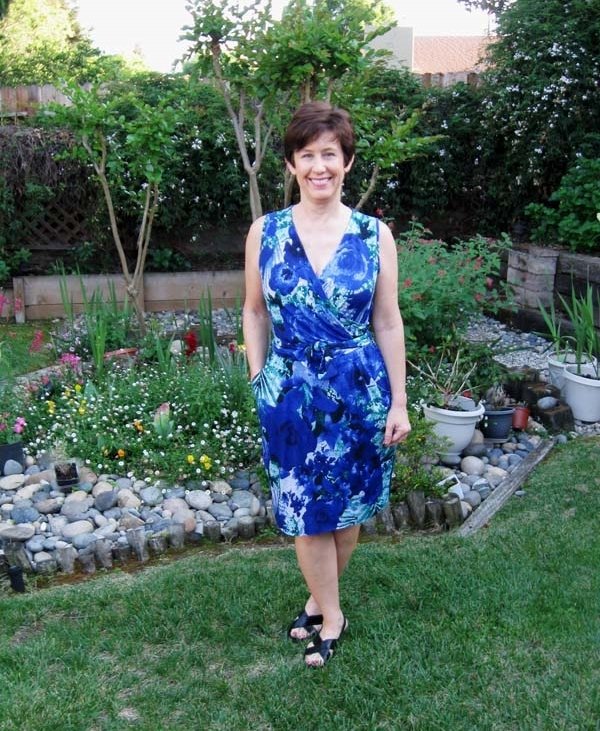 Today's post on their sewing blog is about some fit adjustments on wrap dresses, or wrap necklines in general. Not a definitive fitting post, just a couple of tips useful in fixing common problems with those patterns. 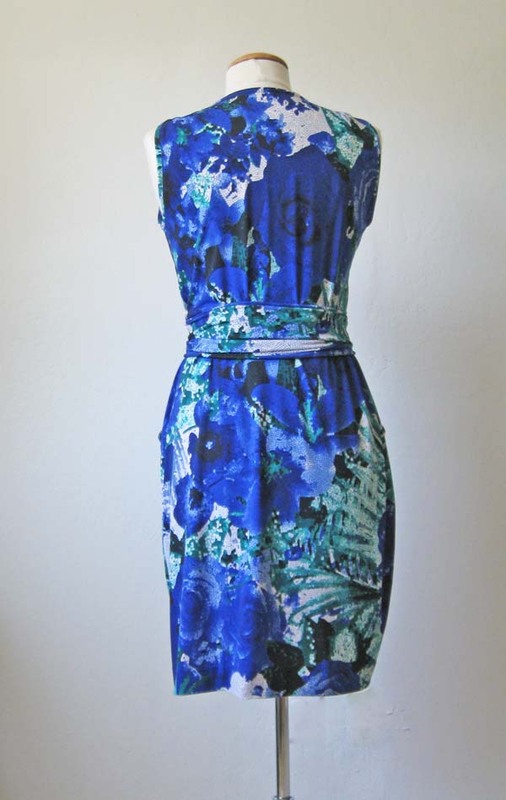 If wrap dress fit is something you are working on, I did a post back in February with some fit info on the vertical adjustment on a wrap dress, with emphasis on adjustments for a full bust or plus figure which I think solves a lot of common fit problems as well. Here is that link which you may want to take a look at if you haven't seen it before. Also on the topic of fitting, I did a couple of posts on sleeve adjustments. 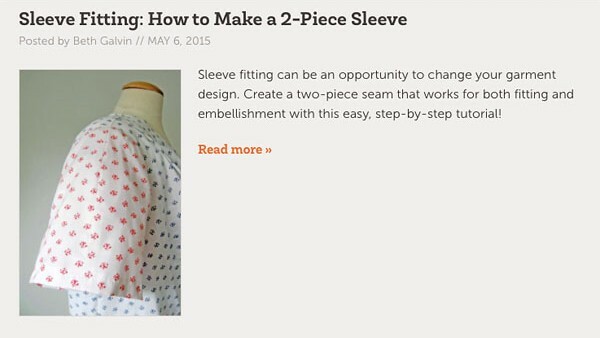 For variety, and useful both for fitting and if you want to squeeze your pattern pieces on minimal cuts of fabric, how to make a two-piece sleeve. This afternoon was going to be all about gardening but the allergy season is sticking around for soooo long around here, and I have kind of a allergy induced headache this afternoon so better to stay away from more stuff like that. Perhaps a little mild-mannered pattern tracing is in order. And I keep seeing these cute culottes in a variety of shapes and styles so perhaps I will check the fabric closet and see what strikes my fancy. Here is today's SunnyGal garden photo. 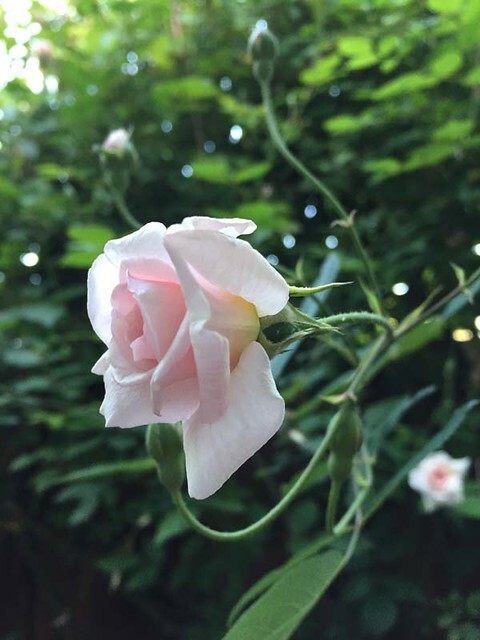 This is a Cecile Brunner rose that lives between the orange and lemon trees. I never water it and constantly hack it back as it threatens to take over. Plus the stems entwine into the citrus trees which makes picking the lemons even more hazardous. Thorns, spines etc. And it only blooms the once in the spring which I didn't know when I put it there. Roses are amazingly hardy but this one is practically an Audrey*. But so pretty when it is all in bloom. *name of the people-eating plant from the Little Shop of Horrors. 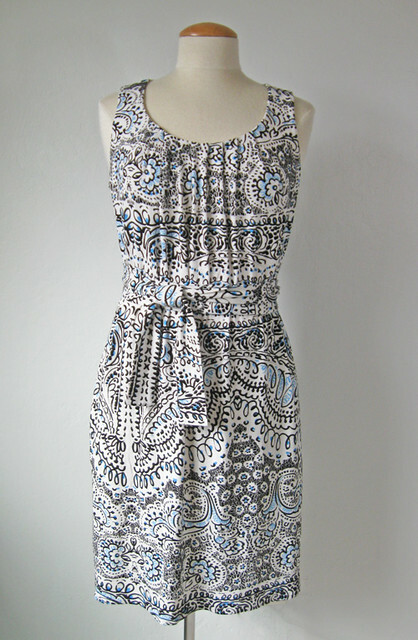 Like the title says, this is the first dress of summer. But the weather is not cooperating. It's Memorial Day here in the US on Monday which means a three day weekend and the official start of summer, but it never seems to reflect that. It might even rain tonight. If only! 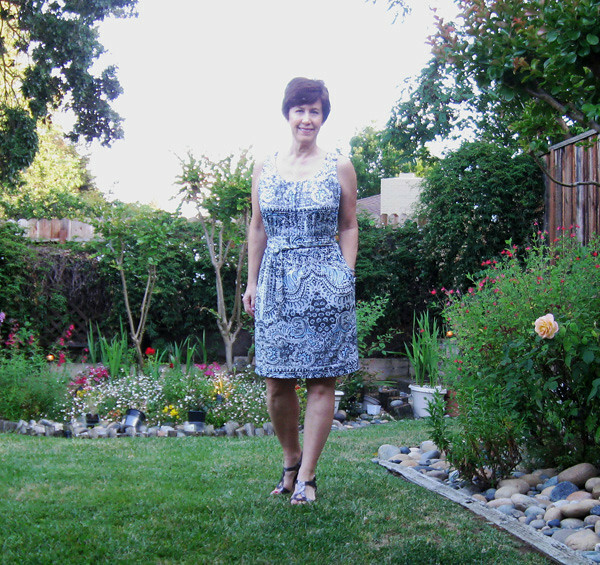 But I did make my first dress of summer. 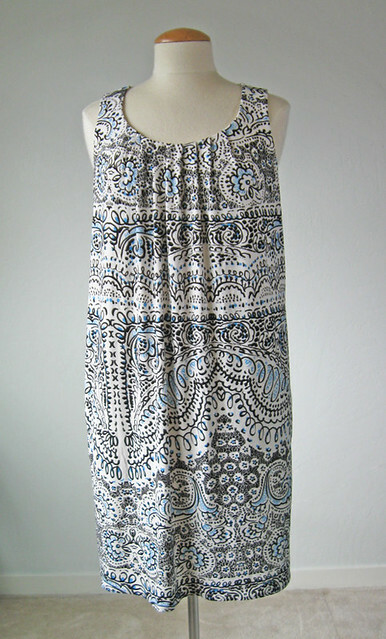 It qualifies as a summer item because it is rayon jersey, super comfortable to wear and sleeveless. Before I get to the details, I have to say that this simple pattern illustrates why I really like Vogue patterns. Perhaps love Vogue patterns. Small details that go together well and result in a very pleasing garment. 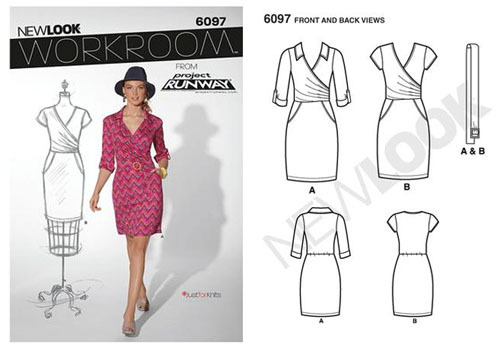 Of course this is a designer pattern so it is a copy of the designer's original work. But the very fact that they make these patterns is really fantastic. Plus you know my obsession with most all these Donna Karan patterns and this is another winner. 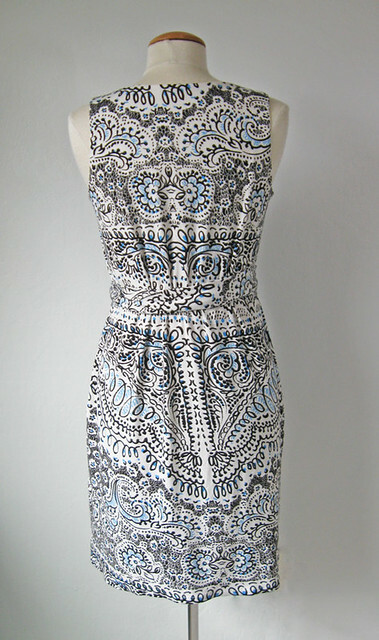 My outdoor shots of this item are mostly not good, so I will start with a dress form picture. Super simple dress but I just find it very flattering. The the width of the straps, shape of the neckline, the pleating are all very proportional and make a nice shape. This post has a lot of pics for a simple item, but if you like fitting details read on. Pattern envelope. I am quite late to the party on this one as it is from 2011 but still in print so it must sell. I suppose this is the actual designer dress but certainly not a color I would choose. 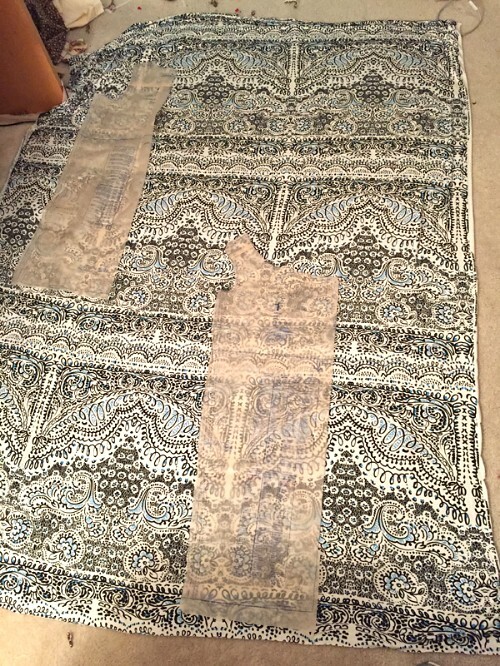 This fabric almost looks like pillowcase ticking to me, maybe it is seersucker. 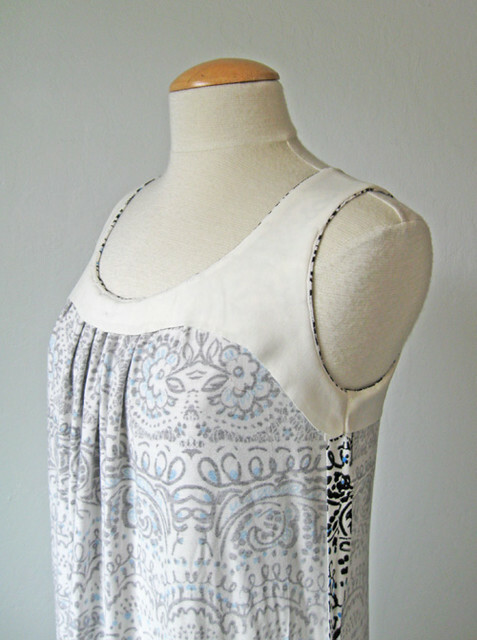 I kind of played around with the pattern pieces and decided a drapey fabric was the way to go. Sometimes dresses with those release type pleats over the bust can get very poofy in a fabric that is not soft or drapey. So how was the fit? OK, I will use one of my weirdly lit outdoor photos. Overexposed on the top half but you can get the idea. Take note of the neckline. I think it is nice and hits at just the right point for comfort and wearability. More on that below. What did I like about sewing this pattern? In a word: Facings! I know that facings get a LOT of criticism in sewing blogs I read, people seem to hate them, but I don't see why. And this pattern has a very well designed facing ( a lot of the designer patterns seem to have nice facings). So here is a look at the inside of the dress. I used a knit jersey for the facings, it is the same fabric I use for a lot of knits where I want to put a lining in all or part of the dress. 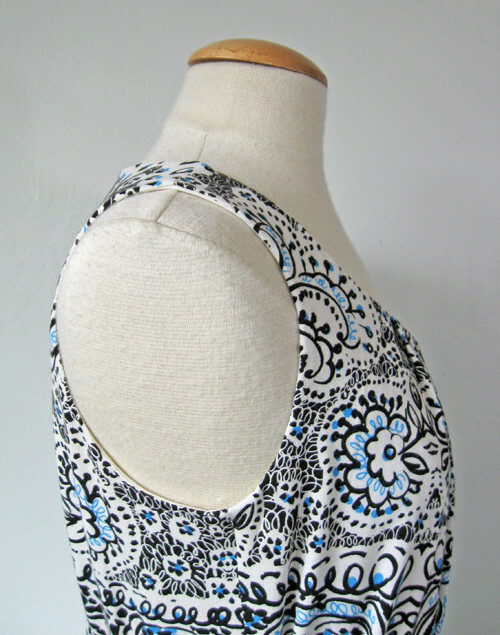 The facing is curved, and is one piece across the front and then the back, so the armhole is enclosed in the facing. 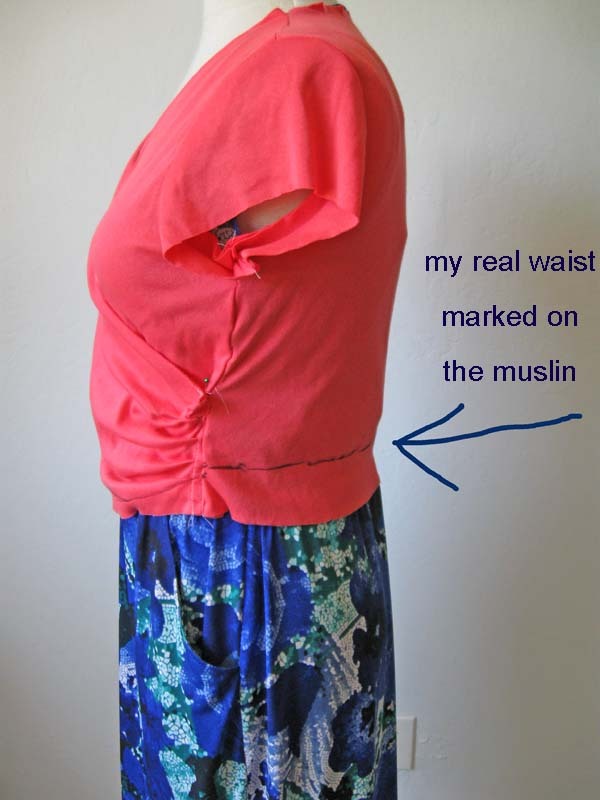 I am not a fan of bias binding, particularly on wovens as I don't think you can get the smooth and flat armhole or other edges with bias binding that you can achieve with a facing. Which is under stitched. Important point! Just to show you why this pattern goes together well, and to promote facings, here are the pertinent steps from the instructions. 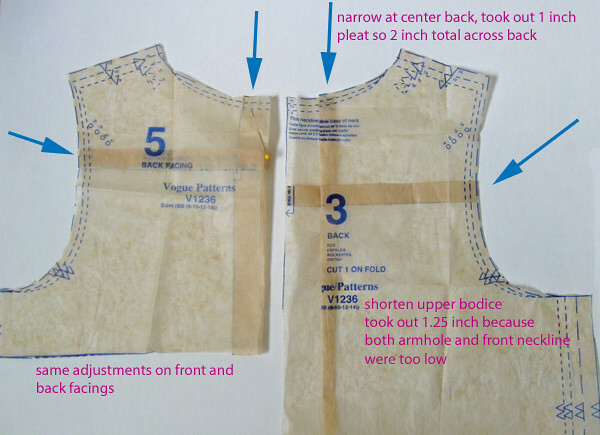 This is the method I use almost always on a dress with no zipper. If the dress has a center back seam then I can use the same facing, or full lining and pull through at the shoulder seams. 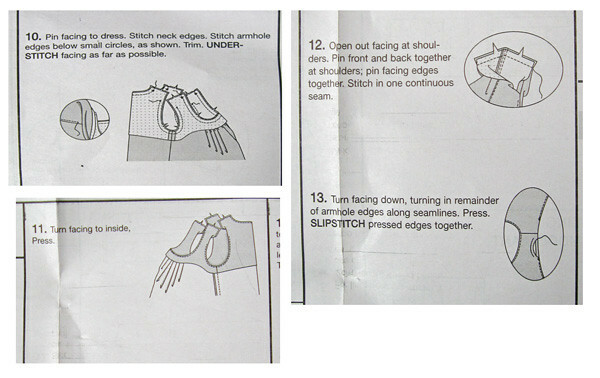 I think this method illustrated here puts people off because they don't want to do any hand sewing? But I like it because you can tweak that shoulder seam and adjust if needed. I sometimes need to take up things there just a smidge and this allows for that little adjustment. How about fit? I used my usual Vogue size 12 and graded out a bit at the hips to a 14 which worked out as I prefer things to be floaty not clingy. But I pinned together the paper pattern pieces to check the neckline and saw that the neckline would be quite low and the armholes also, so I shortened the bodice in that area. I know it seems a never-ending challenge but fitting is all about knowing where to adjust as well as how much. I pleated out from the back 2 inches total and shortened the upper bodice 1.25 inches which turned out to be just right. Not always easy to tell with the pattern tissue. You may wonder why I didn't just take it up at the shoulders? 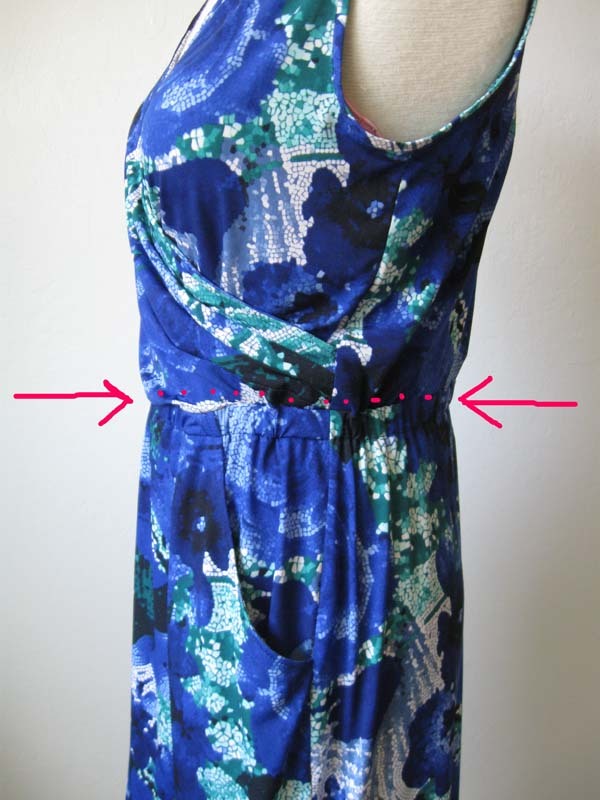 because then the back neckline moves up that amount and to keep the same curves I do the shortening below the neckline. Also then you aren't messing with the width of the shoulder seam. One thing to note is that I probably should have added back the amount I shortened at the hemline. As it is I made a half inch hem. So not much to work with. But I am happy with the length. In fact I have been looking at some of my other dresses and perhaps some hems are a bit too long, making me look shorter? Hmm. something I will have to play around with. Last but not least, this fabric print was a bit crazy. I bought it at Joann's for under $ 12, last summer maybe? and it has taunted me with that repeating panel print for a while. I kept taking it out and playing around with t-shirt patterns but nothing grabbed me. So in desperation to try out this dress I decided to try and turn it into a border print. Reasonable success. It is not entirely centered but the width of the panels didn't allow for that in a dress. Thanks for all the NY Fabric shopping advice you left on my last post. much appreciated and I wish it was me planning to spend some quality shopping time in the Big Apple. As for Instagram, I have stuck with it for a week and it is kind of growing on me. If you take a look at my feed you will see Laura who was my sewing student last weekend. She was here in the bay area from her home in Switzerland for almost two weeks of work meetings, so she took the opportunity to spend 2 days of sewing with me. It was so much fun to meet her (re-meet her, we actually met in 2012 at this meet up, a picture of Laura and Karen in the middle of that post). Anyway - we did fitting of a coat and a dress, covered the ins and outs of collar and lapels by making a test version, talked interfacing, bound buttonholes, sewing with silk and wool, tailoring tools and all kinds of sewing chat. I can't wait to see what she makes next! Happy weekend sewing and a good Memorial Day weekend to everyone in the US. 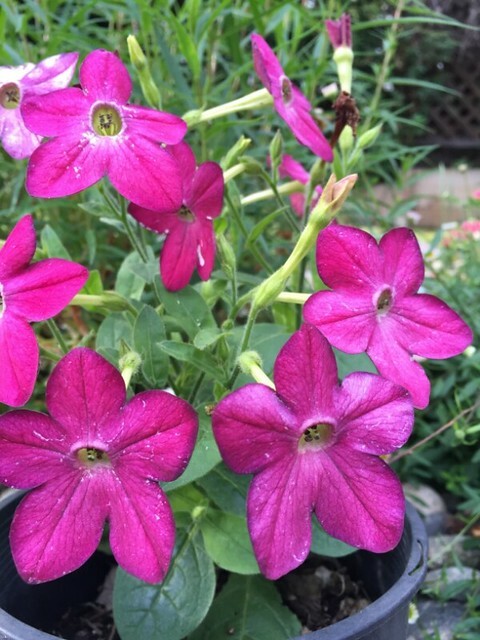 Lots of garden photos this time of year, this is a Nicotiana that survived the winter in a pot. Such a great color. Hello and what's new? For 2015 I have been on quite a roll but that last dress stopped me short. Thank you for all the nice comments, however it has been sitting on my dressform for the past two weeks and it is not growing on me. I just don't like that fabric so this one may go directly to the donation pile. Which is a bit disappointing as I always liked that pattern. Oh well, can't win 'em all. As usual I looked through all the new releases and didn't see anything I wanted/needed on first glance. 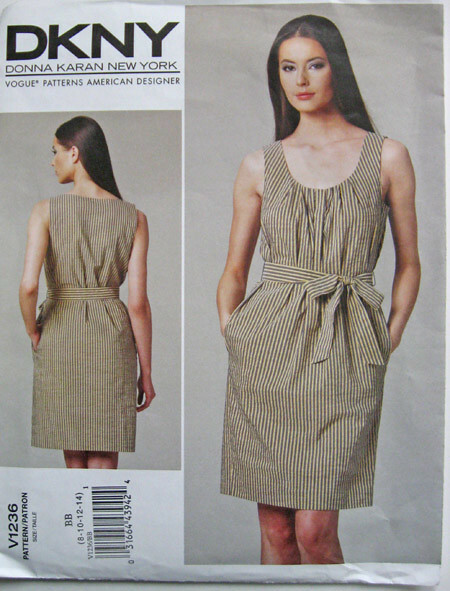 Oops, not true - Vogue 1448 DKNY (my favorite pattern designer) grabbed me immediately and I have already bought it plus have the required yardage (it takes quite a lot for a knee length dress). But that was the only one....or so I thought. Never fails, I go back a day or two later and look more closely, finding a few more, some not necessarily new but next sale I will most likely buy. Is it just me or is there just a lot of sameness? Usually I see something in Simplicity that I really like or find useful as a jumping off point for redesign. They have discontinued what I think are some of their best patterns which is too bad. I dunno. I joined, I uploaded one image. Probably will continue when I have something fun to share.I really like reading blogs. really really really. Everyone please keep blogging. WRITING. I love to read. Images are great but the sentences people write alongside their images - in long form - make me love the online sewing community. So keep writing, fellow stitchers! please. Also on a different note - Instagram kind of creeps me out. It is so bossy. Upload! Follow! Share! you only upload using your phone, not computer which means other cameras are out unless you upload those images to your photo stream. So...many....rules. plus owned by Facebook and I think FB are the evil empire (business-wise) and also creepy, bossy, annoying. What is it about Facebook that annoys me so much? Mostly the co-mingling and blurring of the intersection of commerce and friendship. 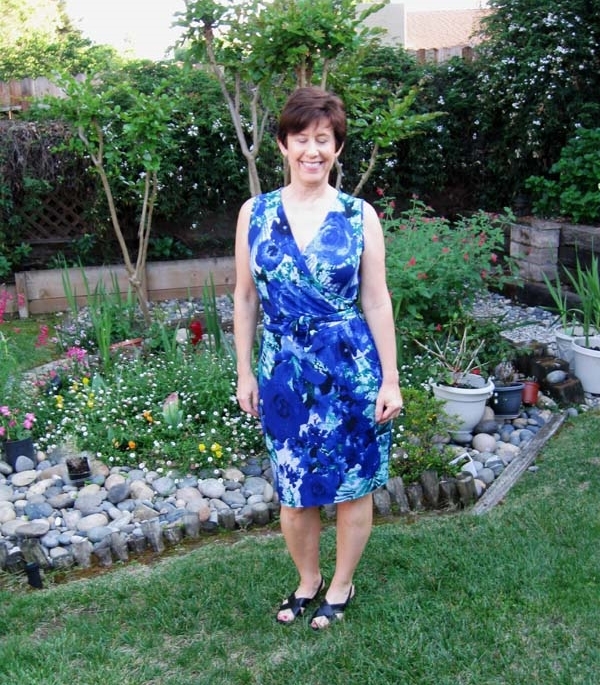 Saturday I went to our Bay Area Sewists Meetup group which was a pattern exchange. Success: I brought 5 patterns and came away with only 1. Afterwards the group usually descends en masse on StoneMountain and Daughter for shopping. 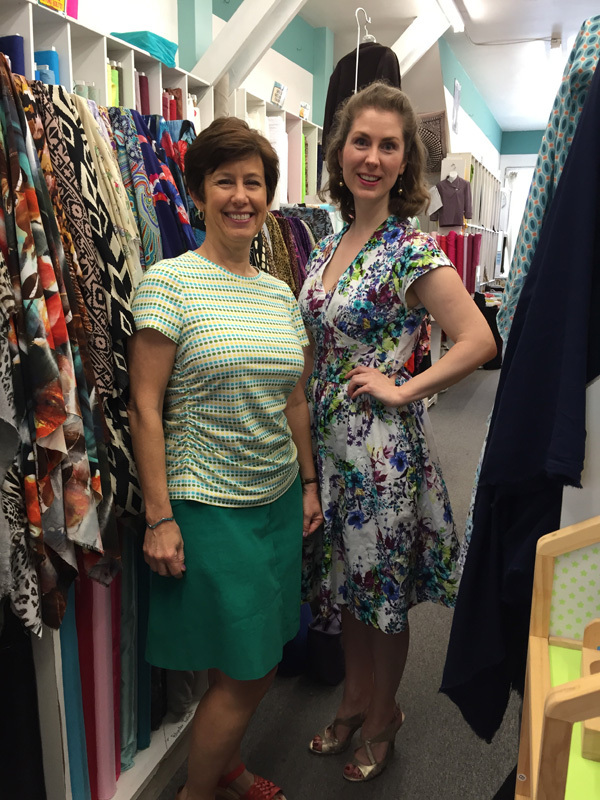 Here is me and Laura (blog Lilacs and Lace) standing between the rayons and silks. I bought two knits but didn't stay to see what she got. She has a very funny post on her blog now about the difference between the pattern envelope drawings and reality. They should use her on the vintage reproductions - she looks better than their models! My top is McCalls 7046 and my green corduroy skirt is Vogue 1170 which is a super cute skirt and now I have a top that matches. Back of the closet for the win! So as we were shopping I had some fabrics in my arms and someone from the meeting walked by and said "wow, you really like loud fabrics". Yes I really do like bright colors, prints, vibrant shades. I have a hard time understanding wanting to wear dark colors or black/grey all the time. But that choice of phrase made Laura and I laugh. OK I am guilty as charged. I call them bright, happy, vibrant, lively, but loud can also describe. Would the reverse be to say "hey, you wear really drab fabrics?" It has taken me a long time to get to a point where I understand that everyone has different taste - what one person loves another thinks is horrible - and that means a lot of designers, merchants, departments, styles can all exist and find their niche or customer base. But I still think that everyone has some colors that can look really great on them and most of the time grey/black/beige don't do a lot of favors. ( although I will concede that the right item in black can be fabulous and it does make a good base for a travel wardrobe) Come to think of it, most who make their own clothes seem to explore the color wheel and I think it is my non-sewing friends and colleagues that purchase their wardrobe that default to solids and dark colors. Probably for the very reason that it is easier to mix and match, dress up or down. Thank goodness for sewing. Advice needed. Not for me, I wish! My friend and muse Heather who I sew for is going to NY in June and will definitely have some time so she wants to go fabric shopping. In the September 2014 Issue of Threads magazine # 174 there is a great article on fabric shopping in NY so I will give that to her but I would love any recommendations. She is not a sewer so stores where they give you some help would be good. In the article two stores sounded a bit like Britex in SF where we shop frequently (NY Elegant Fabrics and B&J Fabrics) but any feedback before mid-June would be appreciated. One of these years I will get back to New York and hopefully both shop and meet up with my east coast on-line sewing pals. Who I have mostly not met with the exception of Kyle :) so lots to look forward to someday. anyway - NY fabric shopping recommendations - chime in. On that or any of the other topics that came out of my keyboard tonight. oh, things are blooming around here, tomatoes are planted, lemons are pollinated and water is being judiciously applied in the garden. 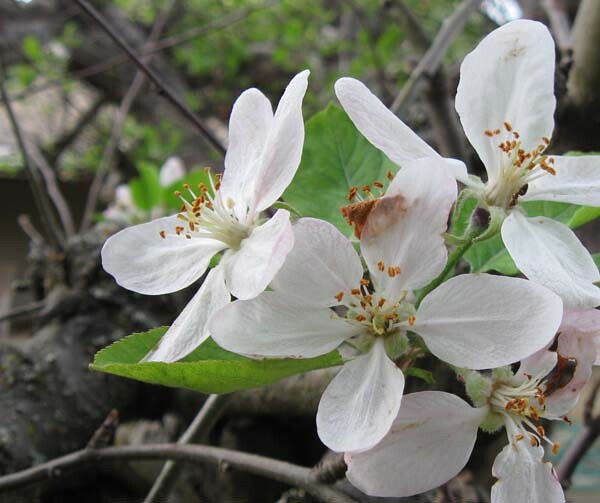 Apple blossoms, just about finished and the little songbirds have started nesting in the tree. The title says it all - this is really a great pattern but I am unsatisfied with the outcome entirely due to fabric choice. I do like the colors but the print seems very old lady to me, and also poly ITY knits are just not my favorite. I think this is just the 3rd item in this type of fabric that I now own. One is a dress that has been worn a few times, and another is a top that I really like - only due to the Simplicity pattern and color. And this is such a great pattern! I have been meaning to sew it up forever - or at least since it was issued. 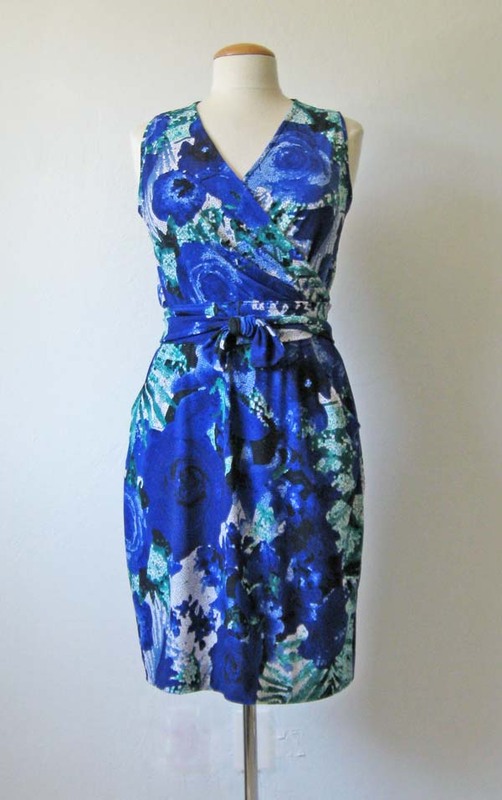 I have used the pattern to make a wrap dress for my friend Heather, and recommended it to others but just never got around to it for myself. So I impulsively bought this fabric one day at Joann's on super sale, thus a smallish investment (around $ 10) and figured I would give it a try. Here is the final version, after some rethinking of the design elements as I went along. Here is the pattern envelope and tech drawing. The details of the design are kind of obscured by the busy print. I started out by cutting out the sleeves, thinking I might make elbow length or short sleeves, but it seemed very geriatric looking. And for some reason the collar bugged me as well so you can see I took that off also. Which was annoying as I had already finished the binding but it wasn't too bad to remove. First Versions: with frumpy sleeves options and then still with collar. Not sure what I have against short sleeves on dresses. As they are fine on tops and t-shirts but somehow on dresses I prefer either long sleeves or sleeveless. And lastly I did some shaping on the armholes. It might not show in these pictures but I cut them it at the shoulder a good inch. 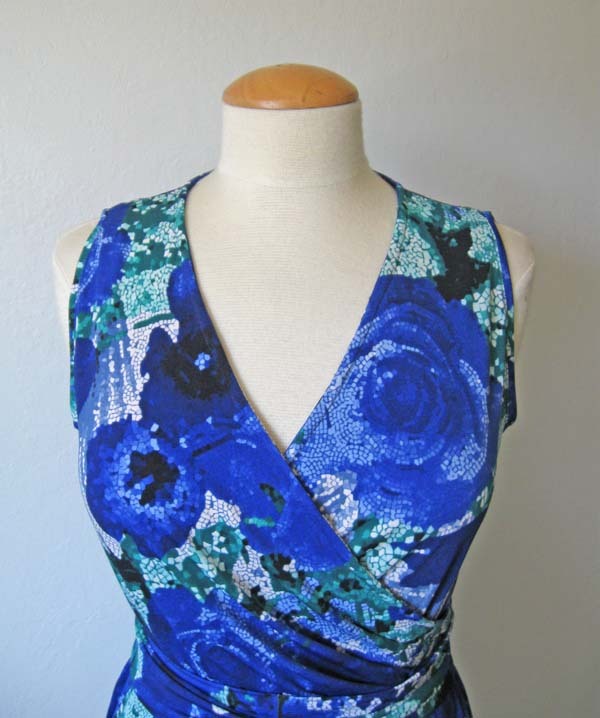 Scroll back up and look at the first picture, and imagine the shoulders coming out further - if you make sleeveless dresses I suggest that you don't just go with the shape of the armhole - customize it to fit your frame. View of finished bodice. I put a small 1/4 inch self fabric binding on the armholes. It looks a bit drapey at the bottom of the bodice and it is slightly but I wanted it to blouse a bit above the waist. 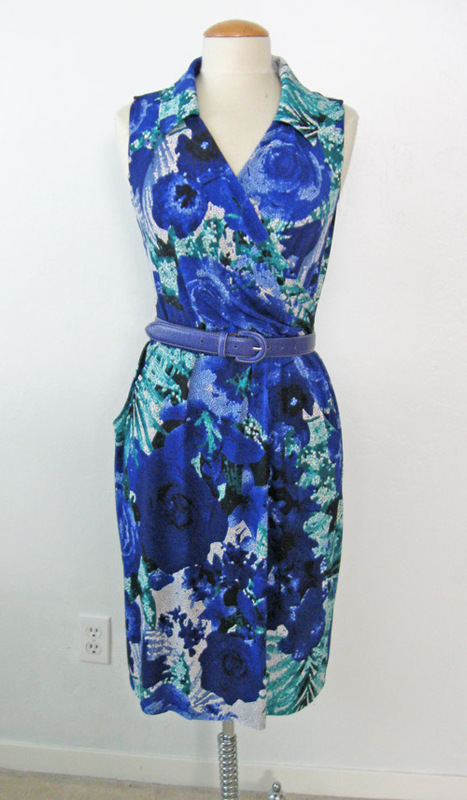 In the other photos I tried a blue leather belt but maybe that breaks it up a bit. I had enough fabric to make a tie belt as well. Fit notes on this pattern: My usual obsession - back waist length. Which some people have inquired as to how to do this on yourself. I made a quick muslin of just the top half of the dress. If I do make a muslin for a dress, usually I just make the top half, unless the whole dress is quite complicated to fit. 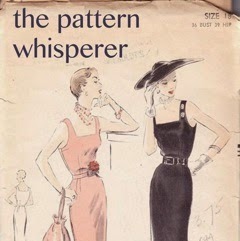 Because for me all the trouble, such as width of neckline and length of bodice can be worked out with minimum effort. I am all about minimum effort (well sometimes). For this dress it was a good idea, as despite looking like a perfect fit on paper, the V-neck is often a trap for new players! Too low, and then you are stuck with a cami. So I raised the skirt in the center back a good two inches, and them tapered back to zero near the center front. 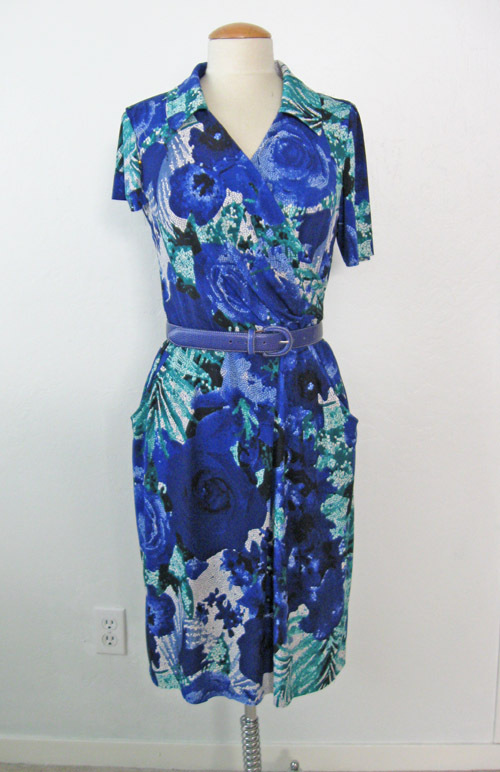 I think the pattern said to sew a channel at the waist and add elastic, which I did. Photo below is the finished dress, so if I had not removed some length from the back bodice I think it would have been very droopy. So that's the scoop on New Look 6087. Maybe I will wear it before the weather turns oven-like, which judging by our 90˚F weather today will be very soon. And look and this is typical of my usual attempts to take photos for my blog. I am a blinker! Does anyone else have the problem? 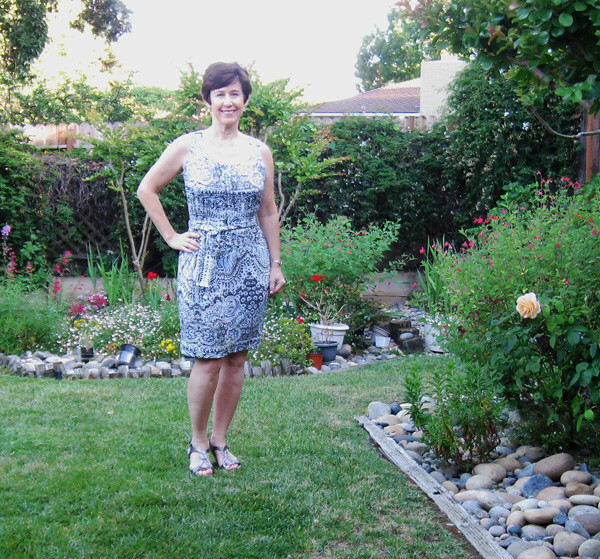 Please ignore the patchy lawn and enjoy the blooms behind me. This weekend I have no idea what I will be sewing - so many items on wish list. 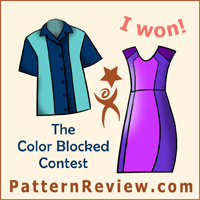 It just might be a dress as I feel the need for a winner!